The precision and care for tenants’ television needs are remarkable. 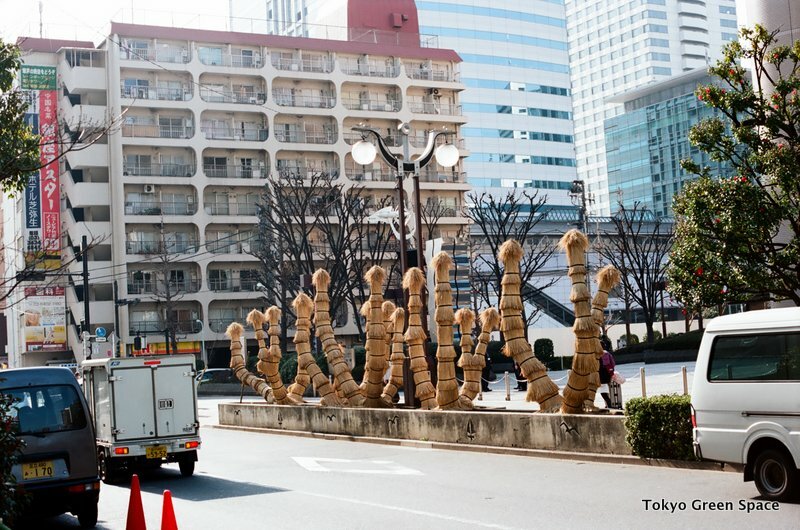 Wrapped in rice stalks to protect them from the cold, these tall sidewalk cycads add an element of traditional Japanese gardens to a large city street. I love the craft and care visible in the wrapping, and the shapes look almost human. I included the photo below to show off the fantastic 1960s or 1970s architecture of the residential building nearby. This Shinjuku ni-chome sidewalk garden is exceptional in its size, care, and labeling. The gardener lives in a former shop in an old building on what is now a busy entertainment district. From the sidewalk, you can see what appears to be merchandise, t-shirts and a few dress shirts, in the front room open to the street. The gardener and his wife are often visible in the inner room which is partly visible. This type of retail/residential architecture is very Tokyo mid-century, and there are examples in many neighborhoods of former shop owners living in these spaces, some with remnants of their former businesses. What I love about this sidewalk garden is the gardener’s obvious care and attention to creating a display of many plants. Nearly all of the pots rests on stools or low tables, with the highest ones closest to the road and the lower ones facing pedestrians on the sidewalk. I am also amazed that the plants are all labeled, even the most obvious ones such as “rose” (バラ). I asked the older man why he labeled them, and he said that people often ask him and he doesn’t always remember the plant name. The other amazing thing about the garden is just how big it is. There is easily more than one hundred plants. In addition to cover five meters or more in front of his building and his neighbors, he also expanded to an equally large area across the street. He is often outside watering and taking care of the plants. I admire this gardener’s love for plants, his colonizing public space, and adding beauty in a crowded neighborhood. I am still pondering last weekend’s trip to the Onbashira (御柱祭) festival in Suwa. It was surprising to see that this uniquely Japanese event has been picked up by the San Francisco Chronicle newspaper website and the Sacramento Bee (check them out for much better photos than mine). I also defer to Wikipedia for explaining the two and half month series of events, from cutting the trees with special axes, to riding the logs down a steep hillside, to erecting them at the shrines. One amazing fact is that this festival has been going on for 1,200 years. 1. I wrote earlier about this unusual mix of animism, forestry, and virility. Animism because of the care and respect for the trees as sacred objects. Forestry because of the tremendous skills in cutting the trees and the long tradition of relying upon wood for buildings, fuel and paper. Virility because of the reckless riding of the logs, which often turn and injure the riders. This year there was a dislocated shoulder. In previous festivals, there have been deaths. But while the log riding is considering the central activity, with large crowds and television coverage, the entire festival features seemingly impossible actions made more difficult by the rituals. Not only are the 20 meter logs carried through the hills and streets, but there are dozens of people standing on the logs which can only make the load heavier. Likewise, in photos showing how they lift the logs at the shrine to stand as vertical pillars, you can see that celebrants again stand on the logs as they are being lifted, adding more weight and danger. 2. In thinking about animism, forestry, and virility, I left out community. The entire series of rituals require hundreds and hundreds of participants, and thousands of spectators who are witnesses in person and through television sets. Hauling the logs are many teams of mostly men in traditional outfits, with different colored shirts marking sub-groups. The logs are tied with ropes and there must have been hundreds of people dragging them through the town. This image of community and exertion was perhaps more inspiring than the very rapid descent down the hillside. 3. There is also tremendous hospitality. Chigira, a young woman who has worked at Sinajina for several years, is from Suwa, and she meticulously organized our weekend. Siblings were marshaled to ferry our group of 11 from site to site, and her parents warmly welcomed us. We learned that weddings are avoided during festival years because the festival and the welcoming of guests is such a large expenditure for all the towns people. 4. While picniking and waiting to watch the log riding on the steep slope, Ito Hiromasa, the Executive Producer and Director of TEDxSeeds said hello to me. It was one of those realizations that Japan is a very small country, and that Onbashira Festival connects city and country people in a deep way. Ito-san also was impressed by the spirituality and mysteriousness of the event. He observed that the great care and hospitality show that the Suwa townspeople “love their culture, land, nature, ancestor and themselves.” These words and feelings seem uniquely Japanese, and I am still thinking about their meaning. Nakano Dori is famous for its long rows of cherry trees. My friend who has lived in Nakano for decades explained how the wide street near the station is newer so the trees there are younger. The older trees have much more interesting bark, and at some points the canopies connect across the roadway. I love how the trees show the human care over so many years. Walking, and perhaps even driving, is so much more fun during sakura time. Its beauty is related to how brief it is. There is also a beautiful row of mature sakura along the Kanda River, which can be appreciated from inside the Chuo and Sobu trains or viewed from inside the British Council. I spotted this very full bouquet in the service station along a highway. Japan’s rest stops are fantastic: huge bathrooms, great variety of food, plus regional food specialities you can purchase for last minute gifts on your way to or from a trip. This is the third of my rest stop flower series (the others were in city subway and train stations). I love the care that someone is taking in a space that others are just passing through. 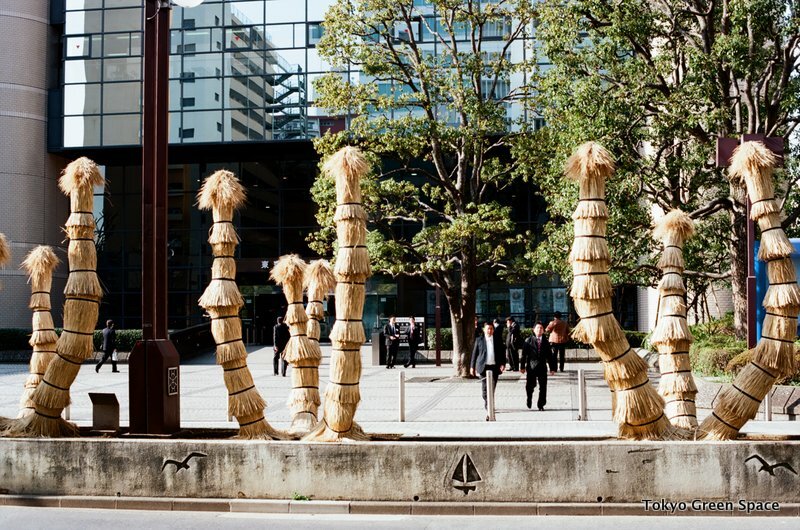 The theme of Tokyo Green Space is how people bring nature into the city. Naturally, I focus mostly on plants and wildlife that bridge city and country. Recently, I have been struck by the amazing photos of nature used to enliven small commercial spaces. Like the Mount Fuji photo mural at the 1960s New Shimbashi Building, this alpine scene has decorated the detergent dispenser at my local laundromat. Oddly, the laundromat looks much newer than this machine, which has been preserved with duct tape and much obvious care. The winter scene evokes Europe rather than Japan, I think. At the entrance to a public elementary school near our apartment is an enormous tree that I frequently pass by. On the other side of the entrance is a beautiful cherry tree. I didn’t pay any attention to the larger tree until the husband remarked that it sports a sign declaring it a “thousand year old zelkova” (in Japanese, it’s keyaki, けやき). I went back, examined the tree more carefully, and took some photos. Does anyone know if this one thousand year designation is literal or figurative? It seems incredible, especially when compared with what I thought was an ancient ginko tree at Kishbojin Temple in Zoushigaya, reportedly 600 years old. Looking carefully at this zelkova tree, I can see that there are huge fissures in the trunk and the tree has been pruned radically, including all the main branches and even the base close to the ground. I would like to think that this tree is a local treasure, and that someone is taking good care of it. Its age gives it character, and its canopy is still very impressive. Recently I visited construction company Kajima’s headquarters in Akasaka to learn more about their extraordinary biodiversity program, and was charmed by the miniature Japanese garden in front of the modernist building. One could criticize the excess of hardscape, but it does make the small traditional garden pop in a dramatic way. The perfectly pruned pines and arrangement around a “river” of pebbles and rock “mountains” makes a wonderful composition. Even the tallest trees are under 1 meter in this miniature dream landscape. While the environmental benefit is minimal, such stylized and well cared for nature creates a beauty that is unquantifiable and a momentary escape from urban life. The contrast not only with the building but the surrounding neighborhood is extreme. A single tree standing in the entrance to a modern Tokyo house provides a marvelous contrast between the traditional and the new. The beauty of the single tree and the clean lines of the boxy concrete home create a uniquely Japanese feeling, or what I introduced recently as wafu modern (和風モダン) in relation to Kuma Kenga’s new Nezu Museum and tea house. The intricately pruned pine tree evokes hundreds of years of Japanese garden design almost single-handedly. The pairing suggests a forward-looking aesthetic that remembers and revitalizes traditional culture elements. From an ecological perspective, the single tree and minimal shrubs provides very little habitat. This quiet cul-de-sac suffers a typical Tokyo over-abundance of pavement, which is a certain pathway to Tokyo Bay pollution from storm runoff and an obstacle to insect and plant life that could feed and shelter bees, birds and other urban wildlife. Still, the effect of the tree is all the more dramatic against the excess of hardscape. I also would regret if urban ecology became a quantitative calculation of efficiencies and benefits. There must be a place for not only traditional culture but also the type of human care and aesthetic appreciation manifest in this stylized pine tree. Can anyone comment on this recent story about FarmVille? Apparently, Farmville is Facebook’s most popular application with 62 million users since it started this June. Like the Sims or Tamagotchi pets, players must carefully tend to their virtual worlds, in this case crops, farm animals and neighbors. Created in San Francisco, this game is popular with city people and farmers from around the world. A recent New York Times story about vandalism of Paris’ visionary Velib bike-sharing program highlighted an enormous advantage that Tokyo has in creating great public spaces: the respect that citizens pay to shared space and to each other. To mitigate climate change, reduce traffic and clean the city’s air, Paris created a remarkable bike sharing program, with over 20,000 bicycles available throughout Paris at a very low rental price. With 50,000 to 150,000 daily trips, this bike-sharing program created a real impact on how residents and tourists traversed the city. Since 2007, more than 80% of the sturdy bicycles have been stolen or vandalized beyond repair. The New York Times quotes Parisian police and sociologists who blame the attacks on “resentful, angry or anarchic youth” in a “socially divide Paris.” Specific blame is given to suburban youth, the mostly poor immigrants who live in the outskirts of the city and view the bicycles as a symbol of urban privilege that they lack. 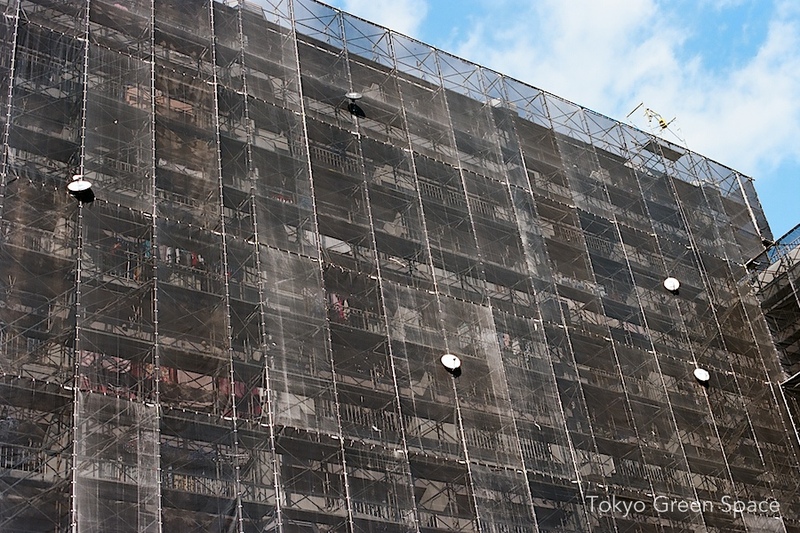 Compared to the extreme inequality in many global cities, Tokyo remains surprisingly safe and clean. 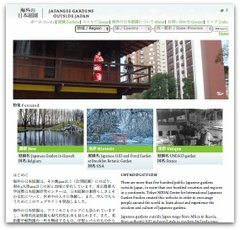 This allows for some amazing new public spaces, from the wonderous Ginza Farm open to everyone and unguarded– disturbed in five months only by a raccoon hungry for one of its ducks (more on this later)– to the many common gardens and plants placed outside homes and shops. Most Tokyo residents are unaware that their relative social harmony is unique. With public behavior the norm, there are unparalleled opportunities to create even more exciting new public spaces that revitalize human life connected to plants and wildlife. Public spaces open at night, habitats that require clean running water, valuable plants that require time and care to mature, the care that individuals and organizations invest in place-making are all more likely to be respected and allowed to thrive in Tokyo.